To renew the alumni data fill in this form. Different schools of Western Europe and America started a tradition of establishing of such kind of associations, where the alumni have a chance to stay in touch with each other and with their Alma Mater and participate in charity events and funds like scholarship funds to benefit or to pay for outstanding students. It encourages students to study harder and ranks a school among prestigious schools all over the world. Interregional social alumni, administration and faculty organization of IBE (Alumni and friends of IBE association for short) was founded in 2000. Today the number of IBE alumni is over 500 people and you are one of them. For sure you have precious memories about the years spent in IBE. That is why we offer you to become a member of Alumni and friends of IBE association and to liaise closely with the Institute in the future. In order to become a member of the Association you need to pay an admission fee of 1500 RUR either on the current account or in the cashier’s office of the Association. Each member is presented with a badge with the IBE logo. Annual membership fee is not less than 1000 RUR. Initiation, Carrier day, Graduation ball, anniversaries of IBE and others. Scholarship fund, whish was established by Alumni and friends of IBE association in 2001 came to 2055 USD, as the target of the Association was to collect 1800 USD. Three first year students (Natalia Domasheva, Oksana Vasilkova and Andrey Kashaev) got their 600 USD grants each from this fund, the 255 USD left were decided to spend on alumni events arrangement as the project was favorably received by the public. The Scholarship fund members` list and the allocation of resources one can always find here ( Grant members 2001–2006). In July 2002 the 1996 year IBE alumni Aleksey Losa created the IBE alumni group at Yahoo (ИМБО — ZBC-IBE_Alumni_Forum). 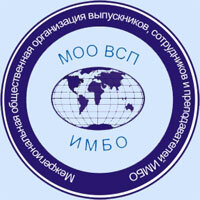 In order to become a member of this group, please e-mail alexey.loza@netzero.net. Learn more about Alumni and friends of IBE association and join us! 124498 Russia, Moscow, Zelenograd, proezd 4806, dom 5, bld. 8, IBE. Tel./fax: (+7 499) 732 4280.